A few days ago I was reading about the hot trends for Spring. Prints made the list. I am not sure about you, but I feel like prints are always fashionable, not just for this Spring. I love this very chic silk polka dot top. I paired it with other classic neutral pieces and beautiful bold blue accessories. The Chanel handbag is added because I have a slight obsession with with all things Chanel. There's nothing more often associated with Spring than flowers. That is why I chose this beautiful floral dress. The crochet neckline gives the dress a slight vintage feel. The handbag has lovely lace over the neutral fabric. Sunny yellow and sky blue is one of my favorite color combinations for Spring. The two-toned lace up booties are incredibly fun looking and in my opinion an attention getter. Don't be afraid to combine and play with patterns and fabrics. This outfit is a little quirky but also sophisticated. Being very matchy-matchy is so boring. love all these ensembles. the first one with the nautical overtones is fabulous! Oooh I love all these sets! Prints are an all year round thing. I'm still afaird to mix different patterns together. I also think that prints are pretty much timeless and come back every Spring. 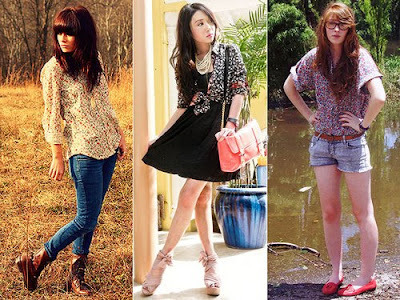 Especially love the polka dots and florals - all these looks are fantastic! I love all the navy, so pretty! i love these romantic flower prints! they're great!